"What happened yesterday is not going to deter us from getting humanitarian aid into Venezuela," the official said on Sunday, speaking with reporters on condition of anonymity. On Saturday, convoys of U.S. aid were blocked from getting into Venezuela, met with violence from forces and gangs allied with Venezuelan President Nicolas Maduro. Venezuelan President Nicolas Maduro could face a new round of sanctions, regional leaders said on Sunday, after his troops repelled foreign aid convoys, with Brazil branding it criminal and urging allies to join a "liberation effort." Troops loyal to Maduro violently drove back aid convoys seeking to enter Venezuela on Saturday, leaving almost 300 wounded in clashes with security forces and at least three protesters dead near the Brazilian border. Juan Guaido, recognized by most Western nations as Venezuela's legitimate leader, urged foreign powers to consider "all options" in ousting Maduro, ahead of a meeting of the regional Lima Group of nations in Bogota on Monday that will be attended by U.S. Vice President Mike Pence. "Brazil calls on the international community, especially those countries that have not yet recognized Juan Guaido as interim president, to join in the liberation effort of Venezuela," the Brazilian Foreign Ministry said in a statement. Brazil, a diplomatic heavyweight in Latin America which has the region's largest economy, was for years a vocal ally of Venezuela while it was ruled by the leftist Workers Party. It turned sharply against Maduro this year when far-right President Jair Bolsonaro took office. U.S. Secretary of State Mike Pompeo told CNN on Sunday: "There's more sanctions to be had. There's more humanitarian assistance I think that we can provide." China and Russia, which both have major energy sector investments in Venezuela, have supported Maduro's government and condemned U.S. sanctions. Meanwhile, Colombian President Ivan Duque, in a tweet, denounced the "barbarity and violence" and said Monday's summit would discuss "how to tighten the diplomatic siege of the dictatorship in Venezuela." Venezuela's Information Minister Jorge Rodriguez, during a Sunday news conference, gloated about the opposition's failure to bring in aid and called Guaido "a puppet and a used condom." Maduro has denounced Guaido for seeking to foment a U.S-orchestrated coup. Trucks laden with U.S. food and medicine on the Colombian border repeatedly attempted to push past lines of troops on Saturday, but were met with tear gas and rubber rounds. Two of the aid trucks went up in flames. Rodriguez accused "drugged-up protesters" of setting fire to the trucks. The opposition had hoped that troops would balk at turning back supplies that are so desperately needed by a population increasingly suffering malnutrition and diseases. Though some 60 members of security forces defected into Colombia on Saturday, according to that country's authorities, the National Guard at the frontier crossings held firm. Two additional members of Venezuela's National Guard defected to Brazil late on Saturday, a Brazilian army colonel said on Sunday. The Brazilian border state of Roraima said the number of Venezuelans being treated for gunshot wounds rose to 18 from five in the past 24 hours. That was the result of constant gun battles, which included armed men without uniform, throughout Saturday in the Venezuelan town of Santa Elena, near the border. Opposition legislator Americo De Grazia said via Twitter that the death toll had risen to 15 in Santa Elena, though Reuters was unable to confirm this. 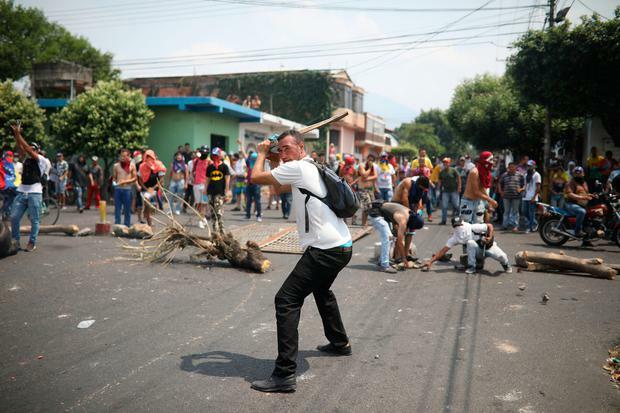 The Venezuelan Observatory of Violence, a local crime monitoring group, said it had confirmed three deaths on Saturday, all in Santa Elena, and at least 295 injured across the country. U.N. Secretary-General Antonio Guterres appealed on Sunday for "violence to be avoided at any cost" and said everyone should lower tensions and pursue efforts to avoid further escalation, according to his spokesman. Though Saturday's effort allowed the opposition to demonstrate that Maduro was willing to repel aid, many opposition leaders appeared despondent and disappointed that the food and medicine had not gotten in. U.S. Senator Marco Rubio, an influential voice on Venezuela policy in Washington, said the violence on Saturday had "opened the door to various potential multilateral actions not on the table just 24 hours ago". Hours later he tweeted a mug shot of former Panamanian dictator Manuel Noriega, who was captured by U.S. forces in 1990 after an invasion. President Donald Trump has in the past said military intervention in Venezuela was "an option", though Guaido made no reference to it on Saturday. During a visit to a border bridge to survey the damage, Duque told reporters that the frontier would remain closed for two days to repair the infrastructure and that aid would remain in storage. "The dictatorship has sealed its moral and diplomatic defeat by showing the world how it persecuted its own with all types of violence," he said. In the Venezuelan border town of Urena, streets were still strewn with debris including the charred remains of a bus that had been set ablaze by protesters. Residents on Sunday were pulling pieces from the still-smoldering wreckage to sell as scrap metal. Most were worried about the continued border closure, which prevents residents from going to work or buying basic products in the neighboring nation. "Today there is still tension, I went onto the street and saw all the destruction," said Auriner Blanco, 38. "The border closure is bad because we need everything they were going to bring over."